In the Kansas City area it is not uncommon for cool-season lawns to look less than perfect after the stress of a hot summer. Disease, drought, heat, poor soil or just plan old neglect may mean that it's time for a round of overseeding. In fact some people have found that in the Kansas City area cool-season grasses should be treated almost as though they are hardy annuals or delicate perennials. In other words, to keep a lawn looking great it will probably need at least some overseeding each year. The optimum time to seed cool-season turfgrasses in Kansas City is during September. This is when nature establishes cool-season grasses; therefore, the best results with the least amount of work occur at that time. Do not delay seeding or the grass will not establish sufficiently before winter and weeds like henbit and chickweed become a problem. March and April are second choices for seeding but are a distant second at best. If you haven't done so in the last 3-5 years take the time to have your lawn soil tested by your local extension office. Simply scoop up some soil (a total of 2-3 cups is plenty) from several areas of your lawn, place it in a bag or plastic container and bring it to your local extension office. The soil will be analyzed and a report, including recommendations will be mailed to you. There will be a small fee for the service. Do not use crabgrass preventers before seeding or on young grass. These are best used as pre-emergents in the early spring anyway. Do not use broadleaf weed killers one month before seeding or on new grass until it has been mowed three times. Most Kansas City area homeowners will want to use Tall Fescue, Bluegrass or a combination of both. With proper management, Kentucky bluegrass forms a fine-textured, high-quality, long-lasting turf. 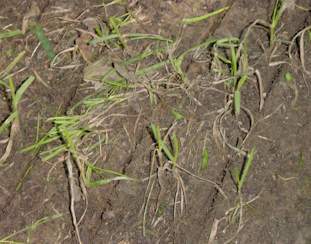 This species produces rhizomes (underground stems) that give rise to new bluegrass plants. This ability enables bluegrass to rapidly recuperate from injury and fill in thin areas in the lawn. Kentucky bluegrass is winter-hardy and capable of withstanding temperature and moisture extremes. During hot, dry periods it tends to become dormant and lose color. If high quality is desired during the summer period, lawn irrigation is often necessary. Kentucky bluegrass requires moist, well-drained soil to develop into high-quality turfgrass. Although Kentucky bluegrass performs best in full sun, some cultivars are adapted to shade. Tall fescue has been used traditionally as a low-maintenance grass in areas where a coarser texture is not objectionable. Tall fescue tolerates soils of low fertility, persists well under low maintenance and possesses good tolerance to insects and diseases. When mature, tall fescue has excellent wear tolerance and, due to its deep-rooted nature, tolerates drought and will remain green throughout most Kansas City summers. Recently, a number of improved "turf-type" tall fescue cultivars have been commercialized. These improved tall fescues are finer textured than the old "Kentucky-31" cultivar. These improved cultivars are less coarse, grow more upright, tiller more readily and exhibit a darker green color. All tall fescues grow rapidly in the spring and require more frequent mowing than Kentucky bluegrass. The popularity of the improved turf-type tall fescues is increasing and they are now being used on many lawn sites, playgrounds, parks and low-maintenance athletic fields where the use of coarser textured grasses is not objectionable. When in doubt your best bet is to find a reputable local garden supply or seed supplier. Visit them, explain your sunlight and soil conditions. Their recommendations should be adequate. Good blends. Most seed is sold as a blend of two or more seed varieties. This helps protect your lawn from succumbing to disease. How well did the seed perform in national and local turf trials? The retailer should have this data. Make sure the seed meets your lawn's sunlight requirements. Grass that thrives in full sun may not grow well in part-shade. Shade tolerant grasses may wilt and die in sunny areas. How much weed seed is in the mix? There should be very little or no weed seed in quality seed mixtures. Remember that good seed usually costs a little more. If your lawn is important to you a couple of extra dollars will be well worth it. Mow the area to 1� inches to reduce competition from established grasses. Short mowing helps prevent the seed from lodging in tall grass and lets light reach the new seedlings. Use a grass catcher on the mower or sweep up excess clippings. Do not scalp off all the existing turf - some is needed to protect the germinating seed from wind, hot sun, and heavy rain. Core Aerate the area, punching at least 20 to 40 holes/ft2 with the largest tines possible. This will increase the seed-soil contact and improve germination and establishment rate. You're not likely to over do it, so make several passes over the lawn. 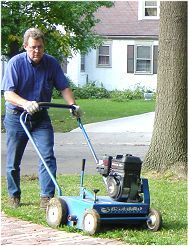 Aerators can be rented from many hardware stores or the whole process can be done by a professional lawn care company. The use of a verticutter or over-seeder is also recommended. This machine (available for rent at many hardware and rental stores) cuts vertical grooves into your soil creating a nice soil to seed contact area (see picture below). It's best to make two or three passes over your lawn at different angles creating a cross-hatch pattern. trenches about 1/8 inch wide (above right). Apply the seed to the lawn with either a rotary or drop-seeder (some verticutters also include a seed hopper to distribute seed). The table below lists the suggested seeding rates. Seed Type Rate per 1,000 sq. ft. 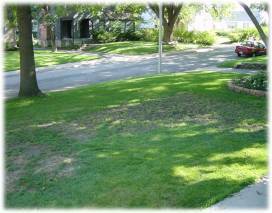 Apply a slow release nitrogen fertilizer over the lawn and water it in completely. To ensure proper germination you will need to keep the seeds moist. This means watering three to four times daily. Light, frequent watering will yield the best results. Tall fescue will germinate in approximately 2-3 weeks. Bluegrass takes a little longer, approximately 3-4 weeks. Five weeks after germination, apply a quick release nitrogen fertilizer at a rate of 1 lb/1000 ft2 . Repeat this procedure in another six weeks for a total of three fertilizer applications (including the first at seeding time). Mow your new cool-season grass as soon as it is 3 inches tall with the mower set at 2 inches. Continue to mow at that height for the remainder of the season, including the last mowing. The root system of your new turf will continue to grow and strengthen even after the blades have stopped growing for the season. You will be rewarded with a quick thickening, healthy lawn next spring.